With mild temps, holiday decor, and not-as-busy-as-other-holidays crowds, spending Thanksgiving at Disney World is a great idea for many people. Here's some advice, including where to spend your Thanksgiving meal and how to handle the crowds. Though Thanksgiving week is definitely considered a busy time at Disney World, it's not nearly as crowded as other times of year like Christmas or Easter weeks. Throughout the week, crowds continue to build, with Saturday-Wednesday generally being slightly less busy than Thursday-Sunday. If you're planning to be there for the whole week, get in some quality park touring time at the beginning of your trip before crowds really ramp up. Though we don't usually recommend Extra Magic Hours, the week of Thanksgiving at Disney World is a good time to take advantage of them if you're staying onsite, especially if you are willing to be awake early/late to take full advantage, and even better if you have Park Hopper tickets and can visit another park during the non-EMH portion of the day. Although restaurants often book up way ahead of time, you can check availability on the Disney World site. Though Thanksgiving decor isn't something that Disney World focuses on, holiday decorations will be everywhere. Mickey's Very Merry Christmas Party - though these begin at Magic Kingdom in early November, they don't take place Thanksgiving week. Closing Magic Kingdom at 6 p.m. for the party to be held would be difficult with the surge of crowds. Candlelight Processional (not available at the beginning of the week) - this holiday event at Epcot usually begins the day after Thanksgiving however in 2018, the first one will be held on Thanksgiving day which is Thursday, November 22. For more information, you can read all about the holidays at Disney World. Get more info about traveling in November on the November Crowd Calendar. 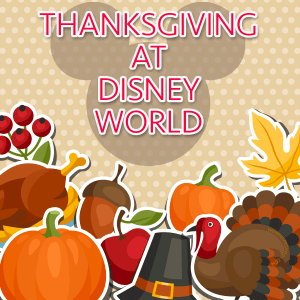 Have any other thoughts on spending Thanksgiving at Disney World? Feel free to share in the comments. Our family will be staying at the Swan Hotel for Thanksgiving in 2017, we are 4 adults, 1 toddler and 1 infant. Since 180 days is approaching fast (in 2 weeks), I’m trying to nail down our choice for eating dinner on Thanksgiving Day. PRO: for obvious theming and cuisine parallels.